When S&S coupling undone the frame was full of water. 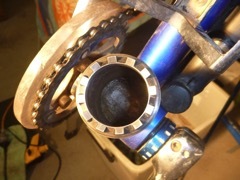 I removed the front section of the frame to replace the headset and found the frame was full of water... in fact it was completely full up to the S & S coupling on the down-tube. The coupling was also pretty gritty and dirty so I spent an hour or so ringing out the screw thread with WD40 and cleaning them up. Obviously I mopped the water out of the frame as can be seen in the photo above. This was completely full of water.